The United States Mint today, January 22, 2013, released the clad 2013 United States Mint America the Beautiful Quarters Proof Set™. These latest annual proof sets are available for $14.95 each, plus the U.S. Mint’s standard shipping and handling charge of $4.95 per order. Found in the set are proof quality examples of the five 2013-dated America the Beautiful Quarters. Each quarter originates from the U.S. Mint’s facility in San Francisco and bears the designating ‘S’ mint mark on the obverse. These five coins represent the sixteenth through twentieth of the America the Beautiful Quarters® Program overall. (See this year’s America the Beautiful Quarter designs for more information.) Inaugural strikes of the series appeared in 2010 with five new ones issued annually. Each new quarter of the program depicts a different reverse design emblematic of a selected site of national interest from around the United States and its territories. When completed in 2021, the program will have honored one site from each state, the District of Columbia and the five US territories. Found on the obverse of all America the Beautiful Quarters is the same portrait of George Washington, by John Flanagan. This portrait was initially created for the 1932 circulating quarter-dollar and has appeared with minor variations on quarters. America the Beautiful Quarters Proof Sets are in their fourth annual release. Packaging for the series has changed throughout the years with the most recent release no exception. 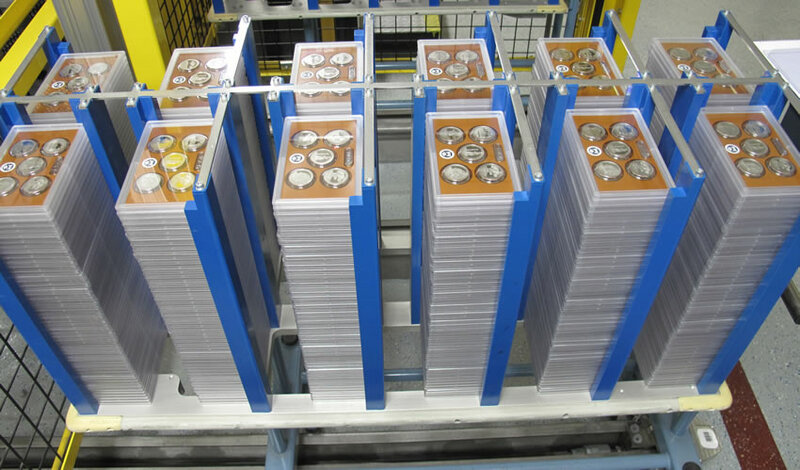 "The United States Mint will debut new packaging for this product in 2013. The image on the front of the outer carton is Mount Rushmore National Memorial, the last quarter of the year," indicates the U.S. Mint in a news release about the set. "The images on the back of the carton include each national park or site, its name, the state, and the year in which the park was established as a national site." Coins of the proof sets are found inside the packaging encased in one protective lens. 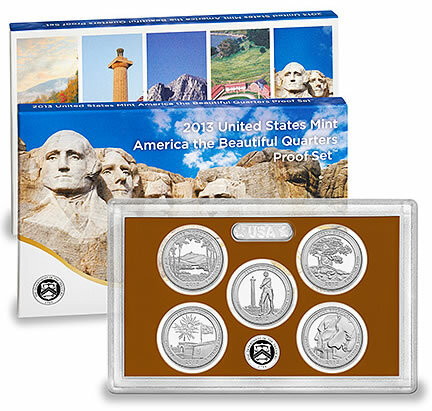 Order 2013 America the Beautiful Quarters Proof Sets directly from the U.S. Mint via its annual product page, or by calling the toll-free number of 1-800-USA-MINT (872-6468). There are no per household ordering limits with mintages determined by demand. Two weeks ago, the U.S. Mint released the silver version of the set, which has 90% silver quarters. Information on other America the Beautiful Quarter products are found on this site’s section of quarter news.